WASHINGTON, D.C. -- In the U.S., higher educational attainment is not related to workplace engagement. In fact, American workers with a college or postgraduate degree are slightly less likely than those with a high school diploma or less to be engaged at work. Employed Americans of all ages with college degrees are less likely to be engaged at work than are their respective peers with a high school education or less, so their engagement is not related to being a recent graduate. College-educated American workers' lower engagement mainly stems from being less likely to strongly agree with the statement "at work I have the opportunity to do what I do best every day." Americans with some college education or a college degree were also less likely to use their strengths at work. The engagement findings by education level are based on Americans' assessments of workplace elements with proven linkages to performance outcomes, including productivity, customer service, quality, retention, safety, and profit. These data are based on surveys of more than 150,000 American adults, conducted as part of Gallup Daily tracking from January through December 2012. Overall, 30% of American employees are engaged at work, according to Gallup's State of the American Workplace report. Gallup's employee engagement index categorizes workers as engaged, not engaged, or actively disengaged. Engaged employees are involved in and enthusiastic about their work. Those who are not engaged are satisfied with their workplaces, but are not emotionally connected to them -- and these employees are less likely to put in discretionary effort. Those workers categorized as actively disengaged are emotionally disconnected from their work and workplace, and they jeopardize the performance of their teams. Americans with a college degree who work in a managerial, executive, or official role at work are, by far, the most likely to be engaged, at 32.5%. Engagement drops significantly among college-educated employees working at all other jobs when compared with their colleagues with lower levels of education -- except installation or repair work. 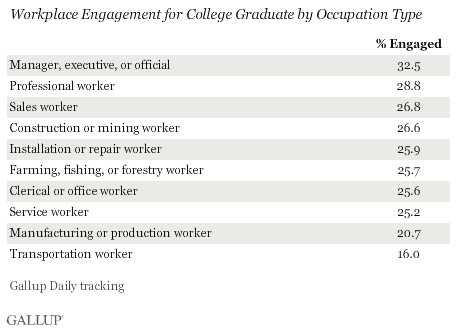 Engagement is lowest (16.0%) for college-educated Americans employed as transportation workers. This pattern is not unique to the college educated, however. Americans, regardless of education level, are most likely to be engaged at work if they are in a managerial position. Engagement data by occupation including all education levels is available on page 2. An increasingly educated workforce is expected to bring many benefits to the U.S. economy, but it appears that just having a college education isn't necessarily enough to feel engaged on the job. As workplace engagement is itself a key to economic growth, a workforce with so many highly educated workers who are either not engaged or actively disengaged is bad for the U.S. economy. Figuring out why college-educated Americans are less engaged is important to improving the economy, but also the educational system. Ensuring colleges are preparing students to get jobs in which they will feel engaged is just as crucial as urging employers to create engaging workplaces. Half of recent graduates are in jobs that don't require a degree, according to a 2012 Gallup/Lumina Foundation poll. This is likely a contributing factor to lower engagement. Building a better pipeline between colleges and workplaces in the U.S. is key. And, even though college-educated Americans may struggle more to find an engaging job, a degree may allow them to avoid becoming "trapped" in a bad job by providing more employment options. Thus, employers and managers should take note and assess the engagement status of their college-educated workers to see if there are ways to improve the work environment and increase the engagement of these highly educated employees. Read more about these findings in The Gallup Blog, by Brandon Busteed, Executive Director of Gallup Education. We have a simple proposal for how we can get back on the path to winning again in education. Results are based on telephone interviews conducted as part of Gallup Daily tracking Jan. 1-Dec. 31, 2012, with a random sample of 151,284 adults, aged 18 and older, living in all 50 U.S. states and the District of Columbia, selected using random-digit-dial sampling. The margin of sampling error for most states is ±1 to ±2 percentage points, but is as high as ±4 points for states with smaller population sizes such as Alaska, Rhode Island, Vermont, Wyoming, North Dakota, South Dakota, Delaware, and Hawaii. Samples are weighted by gender, age, race, Hispanic ethnicity, education, region, adults in the household, and phone status (cellphone only/landline only/both, cellphone mostly, and having an unlisted landline number). Demographic weighting targets are based on the March 2012 Current Population Survey figures for the aged 18 and older non-institutionalized population living in U.S. telephone households. All reported margins of sampling error include the computed design effects for weighting. More Americans disapprove (53%) than approve (37%) of the government program that obtained telephone call logs and Internet communication records. Americans are split on whether leaker Edward Snowden did the right or wrong thing. Workers in Louisiana, at 37%, were the most likely in 2012 to be engaged in their jobs -- meaning they are involved in and enthusiastic about their work. Those in Minnesota, at 25.7%, were the least likely to be engaged at work. For U.S. workers, a lack of exercise is more closely linked to being obese than any of 26 other behavioral and emotional factors examined. Other factors linked to obesity include not eating healthy, struggling to afford food, and depression. 10 Traits of Successful Builders: Which Ones Do You Have? Learn the 10 traits of successful builders and how you can discover and apply yours to build your biggest idea -- starting today.